Winterization and fall services might be the most critical to ensure a successful boating season. Decades of experience have perfected our fall service strategy to not only winterize your boat correctly but also thoroughly inspect your boat to prevent unexpected issues. When your boat is scheduled for fall service at MasterCraft Colorado, you can expect only the best for your boat. We offer all of the services that will help protect your investment now, for a worry-free season next year. 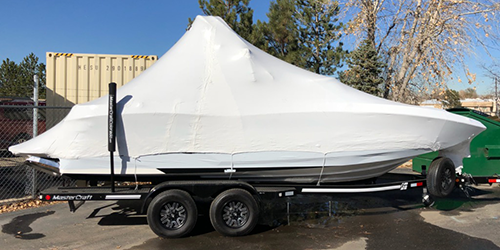 Winterization service, storage, and shrink wrapping will help shield your boat through Colorado winters. Winter is also a great time to add those fun upgrades to customize your boat. MasterCraft Colorado delivers first class service you would expect from the Top Servicing Dealer 2018 – North America. Protect your boat with our Winterization service. As part of our service we drain and flush the engine and all hoses then circulate antifreeze throughout engine and hoses. Drain ballast and add antifreeze to the ballast system. We then disconnect the batteries and add fuel stabilizer to the fuel. With the boat protected we then inspect the trailer for needed repairs and set tires to correct pressure. Our service also includes summerization in the spring. Protect your boat from the elements including harsh dirt and sand, extreme temperatures, and moisture with our boat shrink wrap service. We take the steps to make sure your boat it protected from the elements all season. Our wraps are re-enforced to withstand the harsh Colorado winters. Here are some of the features that make our wraps better than the competition. All boats are wrapped with the tower in the up position unless specified otherwise by the customer. Boats without a tower will be wrapped with an interior support system constructed. Less than 24 spots still available! Now Available! We are now able to offer limited seasonal outdoor storage. Starting May 1, 2019, we will be offering outdoor storage as well as year-round indoor storage. Call 303.429.1895 or fill out the form below to schedule service or reserve your storage spot today!